Faith Herbert has been through a lot in her short time in Los Angeles. As if starting over in a new big city wasn't daunting enough, Faith had to try and leave her past behind while getting a job and making new friends. Now, a group of villains is conspiring against her in secret, joining forces to get their revenge. Jody Houser is responsible for writing one of the best characters in comics, a flagship of a character for Valiant Entertainment. She's brave and powerful but still human with emotions and insecurities like the rest of us. A cubicle-dwelling content writer by day, a fearless hero of justice by night. She's beginning to settle in as she's been able to be herself around some of her co-workers now that her secret alter-ego is a secret no more. It's the most comfortable we've seen Faith in a long time. However, this respite from stress and worry is going to be short-lived as villains she's faced before are teaming up. As we know, any hero is only as good as their villains and Faith's villains are great antagonists because they relish being evil. The alien Sidney Pierce, the thief Murder Mouse, the parasitic entity Dark Star trapped in the body of a cat, and the mastermind Chris Chriswell. They are up to no good and a hoot when they assemble. Marguerite Sauvage does a magical job with the flashbacks and Joe Eisma has proven to be a wonderful storyteller with his clean character designs and expressive faces. They don't get more expressive than Sidney's face and Eisma shows off impeccable timing in maximizing the humor in each of her exaggerated looks. Andrew Dalhouse enlivens everything in bright colors in step with the lighter tone of the story. 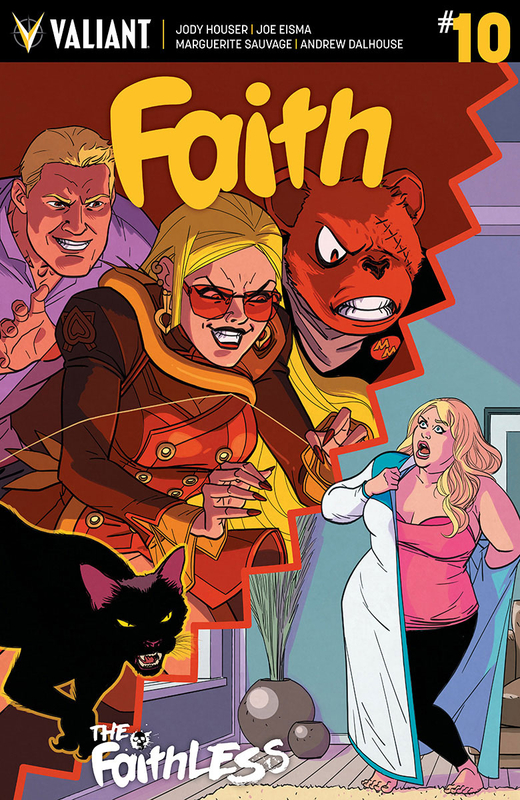 'Faith' #10 is an easy way to get on board with one of the most entertaining comics being published. Houser sets up a new arc with Faith at ease while an engaging band of criminals make their move. It would be a crime to miss this series.